Photo by Anna Williams, BPL Communications Dept. Instead, the team sought to create an experience that would appeal to experts in the field as well as visitors new to Shakespeare’s works. They designed an immersive experience that had as many access points as possible and piqued visitors’ interest by including some of the scandals that surround Shakespeare’s place in literary history. The presentations, accompanied by biweekly curator talks and other programming, aimed to engage visitors with compelling graphics and a structured narrative without overwhelming them. 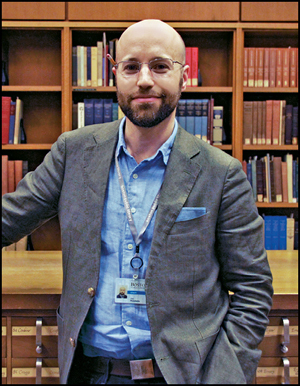 Moschella also participated in BPL’s first Facebook Live event (bpl.org/exhibitions/shakespeare-unauthorized) and starred in a series of videos and written blog posts.